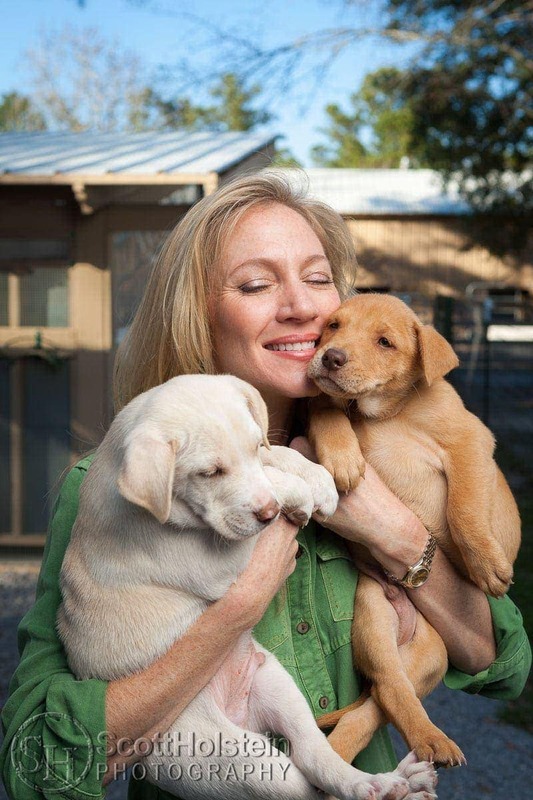 Alaqua Animal Refuge founder Laurie Hood cuddles with two puppies in 2008. The refuge and Hood will be featured on the new tv series “Animal PD” on National Geographic’s network, Nat Geo Wild. Hood founded the refuge in 2007 in Freeport, Florida. Scott Holstein/Rowland Publishing. Alaqua Animal Refuge and its founder, Laurie Hood, will be featured in a new television series on National Geographic’s network, Nat Geo Wild, along with Walton County Sheriff’s Office’s Criminal Investigator Breezy Adkinson. The series, “Animal PD,” premieres on April 14th at 9:00PM. Read more about the show in the Northwest Florida Daily News. Placing the subjects in the shade gave me easier control over the lighting than if they were in direct sunlight. A large octa softbox at camera-right provided a soft boost of light. If no shade is available, sometimes a large softbox can both shade and light the subject. A daub of peanut butter on Laurie’s cheek was intended to help create a moment with the puppies. However, they ignored the treat, causing my trick to fall flat. Luckily, Laurie did what she does – she loved on the animals, creating the moment that makes the photo. See how my peanut butter trick redeemed itself on my photoshoot with quarterback Christian Ponder and his dog Dallas. I watched this show because I grew up in the area. Some of the things filmed were ridiculous. You don’t get beans out of a boy horse by just running a hose up the sheath. Breezy needs to study up some on equines. And trying to load that horse so close to a wire fence. Then the second show they talked about freezing temps, but while driving the trees were in full leaf. Thank you for your comment. However, I am not associated with the production – I am a portrait photographer who photographed Laurie Hood for Emerald Coast magazine when she first opened Alaqua Animal Refuge. If you have feedback for “Animal PD,” you may want to write to Nat Geo Wild.